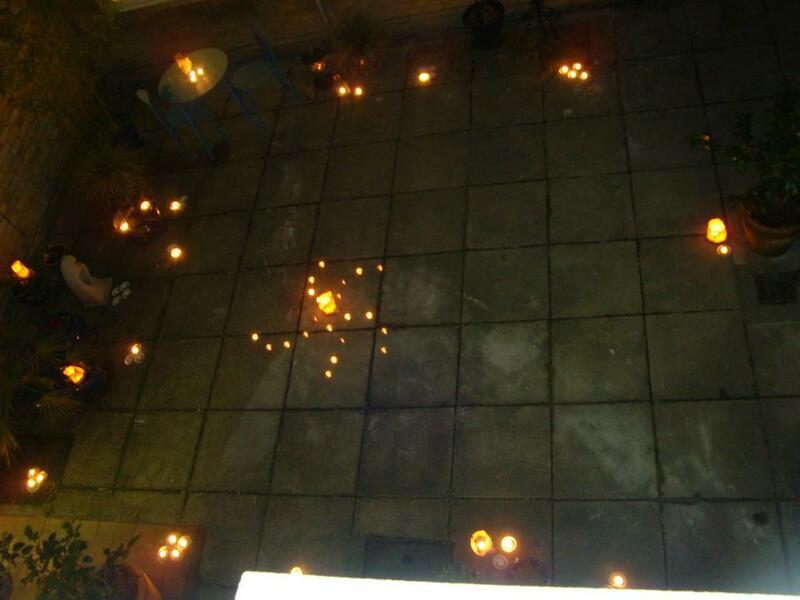 Last month the Hindu students in our house hosted a celebration of Diwali, the festival of lights. They went the whole hog, ingeniously improvising coloured powders to create a rangoli in our hall, and cooking a delicious vegetarian meal. As with the following week's Thanksgiving, a lot of care, love and enthusiasm went into all the preparations, resulting in a truly wondrous evening. And as with Thanksgiving this is traditionally a family celebration, and the Norham Gardens family joined in with great gusto, especially when it came to draping ourselves in Indian scarves and the post-dinner Bollywood dancing! But first... we lit candles. 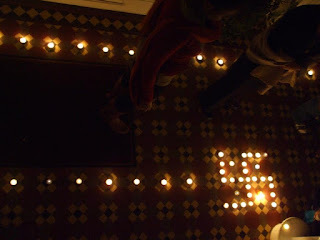 Dozens of tealights had been arranged in the hall; electric lights were turned off and together we lit these little lights, passing flames from person to person. I'm sure I wasn't the only Catholic there who was reminded of the Easter Vigil as I watched reverent, expectant faces light up in the gentle glow. An excited hush descended as we surveyed and photographed the new light bathing our hall, winking at us almost underfoot. Tealights may be tiny, their individual flames small and feeble, but together they were unexpectedly powerful and beautiful. I watched a student who arrived late just stop and survey the scene, her face softening. Oh... how beautiful... was all she could whisper. But there was more, unexpected, light to come. Two students slipped away during the dancing, to work on a surprise; then, as we cleared up, they invited us into the quad, which had been transformed (there's no other word for it!) Dozens of tealights embedded in sand and fairy cake cases winked and waved at us from the concrete slabs on the ground, their flames reflected in the ceramic pots. Others glowed through translucent bags, or peeped out from ornamental pagodas. The whole effect was magical, moving and truly awesome. We stood in a reverent silence, drinking in the scene, savouring not just the beauty but the thoughtful generosity which had created it. We tried taking photos, but none can quite do it justice (though this one, taken by Amogh from an upstairs window, comes close). I was close to tears, my heart bursting with so much that was good. 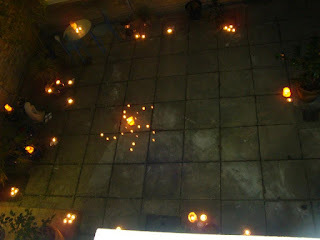 Those tiny, insignificant, cheap, fluttery tealights contained so much beauty, so much power and light. Beautiful, Silvana. A bright and joyful Solstice to you!